There's a saying: "Be careful what you wish for, because it might come true." Utah Democrats have been hoping for a massive voter turnout for decades, a key to turning the tide on their superminority status. That wish may have been granted with the record-high turnout at the March 22 presidential caucus. But with at least 25 percent of the vote coming from first-time caucus-goers—primarily younger voters inspired by the campaign of Vermont Sen. Bernie Sanders—a rift is growing between the new voters the party desperately needs, and an establishment that may not want the changes these voters are seeking. "It's been 40 years since Utah Democrats held a majority in either the Utah House of Representative or the Utah Senate. If that is ever to change," says Jason Williams, a longtime Cache County-based political strategist. "It would take a substantial and consistent turnout of Democratic-leaning voters, particularly young and minority voters." But in a state with one of the worst voter-participation rates in the country, that challenge has been difficult to mount—at least, until this year, when the draw came from an inspiring national candidate. According to Democratic Party political director T.J. Ellerbeck, more than 80,000 voters turned out to their neighborhood caucuses, often waiting in hourslong lines to cast their vote for either Hillary Clinton or Bernie Sanders. That number dwarfs the 10,000 to 15,000 in 2014, and the 15,000 to 20,000 who showed up in 2012 (during the last presidential election). When the dust settled, Sanders received more than 77 percent of the vote. That's when the issues started. According to the party's estimates, at least 20,000 of those voters were first-time participants, and most were drawn in by Sanders' unapologetic message of income equality, higher taxes on the wealthy, impacts of climate change, and strong social and welfare programs. Many voters were new to the process, and few understood the complex politics behind the delegate-allotment process. That's why many Democratic voters were appalled to find out that while the regular pledged delegates were divided among Sanders and Clinton proportional to the vote, the majority of Utah's elected Democrats support Clinton, and half of the state's four superdelegates would be supporting the former secretary of state as well. That feeling of exclusion has carried through to neighborhood community meetings and party gatherings, where new progressive voters say they feel like they're being looked down upon by the more established party officials, candidates and supporters. Even on Facebook, it's not uncommon to see established party figures, responding to the strong concerns of Bernie supporters, posting comments like "destructive," "ignorant," "poisonous," and "they should just go start their own party" to describe this new generation of voters. Many Sanders supporters have responded in kind, and conversations, particularly those on social media, have quickly devolved into ugly name calling. But that still leaves the Democratic Party with a big question: How do they keep the tens of thousands of voters who showed up last month on caucus night activated, engaged and voting for Democrats? Out of the wave of support for a more progressive approach to politics in Utah has come the United Progressive Coalition of Utah, which put forward eight candidates seeking to carry Sanders' progressive message in the Legislature. Three of those eight are challenging sitting Democratic House Reps. Rebecca Chavez-Houck, Carol Spackman Moss and Lynn Hemingway. City Weekly sat down with the respective UPCU challengers Darin Mann, Aubrey Lucas and Alexis Hall and the first thing each said was they don't see themselves as running against the incumbent Democrats. "I really don't look at it like that," Lucas says, noting that she and Spackman Moss agree on many things. "But in 16 years in office, [Spackman Moss] has never run a contested race, and I feel like now is the time for my generation to step up and have a voice," she says. Mann agrees, saying those three incumbent Democrats "deserve all the credit in the world, because they've been fighting really hard as the minority. I don't think inner-party challenges hurt the party, in fact they're critical to keeping us moving forward." Lauren Littlefield, executive director of the Utah Democratic Party, concurs. "We have no problem with [inner-party challenges,]" she says. "We want people to get involved in the process in whatever way they feel comfortable doing so." But the challengers are worried—not that they would lose their races, which each subsequently did at the April 9 Salt Lake County Democratic Party Convention—but that the response to their candidacies and the wariness flowing from party regulars is going to keep new voters home in November. "That's what people who don't live in the world of politics think of it," Lucas says. "It just looks like 'we're the establishment and we've got it—so step aside.'" Alexis Hall adds, "People notice when, every time I go to a community event, someone introduces me as 'the young girl who's running against Lynn Hemingway.'" Many longtime Democrats have now begun encouraging a message of party-building, asking new voters to support the party no matter what and to just vote Democrat in November. That draws a sigh from Mann, who says, "There's a reason there are so many thousands of people who haven't shown up for the party before. It's not about loyalty to a party, and the party-building argument just isn't effective. When you operate like that ... people get tired of the status quo, because it's always the same. There's never anything new or exciting about it that really reaches out and inspires more people to get involved." 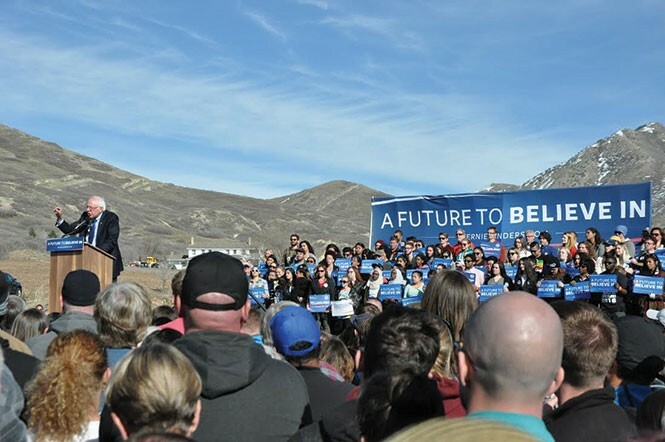 That sentiment was reflected at the convention, as delegates overwhelmingly passed a nonbinding resolution encouraging all four of Utah's superdelegates to support Sanders at the Democratic National Convention this July in Philadelphia. Littlefield says having these new voters stay home on Election Day because of dissatisfaction with party politics "is a real concern," but she's confident the party will find a way to bring them in and mobilize them. "We don't know how we're going to do it yet," Littlefield says, "but we've got to show the thousands of new voters that it's not just about the presidential race, but that we need them involved in the congressional races and in the state House and Senate races, too." It's been seven years since Utah Democrats have increased their numbers by even one seat in either the House or the Senate. "If that's going to change this year," Williams says, "the bridge between new voters looking for a wholesale rebranding of the Utah Democratic Party as an aggressively progressive voice, and the party establishment that isn't necessarily looking to be that voice in deep-red Utah, is going to have to be bridged somehow—and sooner rather than later."